To be a God parent is not just a formality. In addition to specific responsibilities to the baby after the sacrament of baptism, the godparents have obligations to be direct participants in the sacraments. Godparents participate in the baptism of the baby. If the priest is the celebrant of the sacrament, godparents - the main assistants of the priest during the baptism of a child. Was the baby brought to the temple for baptism, during the sacrament is in the hands of the godmother or godfather (it does not matter - it will be more convenient and familiar for the baby, the godfather and need to keep the child). In addition, godparents vows of renunciation of Satan and the combination Jesus Christ. That should be the responsibility of the godparents immediately upon participation in the sacrament. The priest asks special questions to which you answer godparents (along with the last reply about the renunciation of Satan are themselves physiological parents). After the baby baptism in the Holy font (immersion of the child in the water) the godparents accept a new Christian. That is why is also referred to as godparents and sponsors. Then the godparents dress the baby. However, it can equally do and physiological parents. At some point during the baptism the godparents along with a baby and all present at the baptism three times go around the font during the singing of the priest that baptized into Christ and put on Christ. 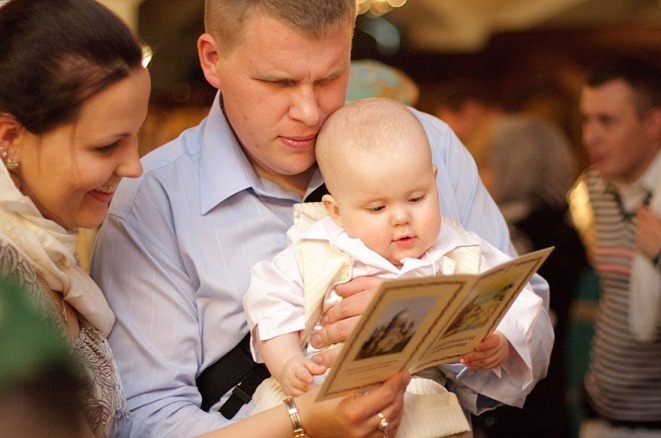 In some Orthodox churches there is a practice of reading certain prayers of godparents during the sacrament of baptism. Thus, in some parishes it godparents read the creed (the main prayer of Orthodoxy, showing the meaning of the basic dogmatic truths). At the end of the sacrament of baptism the godparents are presented with a gift of newly minted Christian, the icon of the Lord Jesus Christ or the virgin, as well as the image of the Saint, after whom is named the baby.